Hillary has returned to her hometown of Bozeman to offer, along with other services, a highly specialized procedure that saved her quality of life and paved the way for her to become a doctor in the first place. Hillary grew up in Bozeman during the 80s and early 90s, long before the crazy economic growth hit and it was still a sleepy little slow-paced town. But, for Hillary, it was anything but stress-free. From an early age, she faced some significant health challenges. Headaches and chronic head pressure were things she had dealt with for as long as she could remember – since before she could even talk. In fact, they were so ingrained in her day to day life that she assumed everybody had headaches. Many days she would wake up with a headache, and go to bed with a headache. She had been to see multiple doctors in Bozeman, but they had offered no answers or solutions. Not only that, doctor after doctor kept telling her that there was nothing wrong with her. But it was becoming more and more clear to her as she grew into her late teens that something was, in fact, wrong. On top of the headaches, she had started suffering from a number of other symptoms, including anxiety, heart palpitations, panic attacks, pain in her body, and fatigue (as she looks back on it now, she believes it may have been a combination of Chronic Fatigue Syndrome and Fibromyalgia). All these health conditions were really starting to get in the way of her living her life. So, at age 17, in a state of desperation and willingness to try something that, at that time, was pushing the envelope, she went to see a naturopathic doctor in town named Dr. Willow Moore. That’s when things started to change. Dr. Moore prescribed a strict dietary regimen. At the time, Hillary’s approach to diet was eating with her friends at Little Caesar’s or Wendy’s. Dr. Moore’s approach included eliminating foods such as sugar, cheese, and yeast. It was not an easy task for a seventeen-year-old, but she followed the dietary recommendations to the letter. And it worked. For the first time, she experienced relief from her symptoms. In fact, after eating this way, her fatigue and anxiety completely resolved. Her headaches improved significantly, although they would still come and go from time to time. Hillary had always been drawn to holistic healthcare, and with a desire to see more of the world, she started by enrolling in Seattle Massage School in Washington. Massage was initially a great fit for her. She threw herself into her studies, graduated, and started building what, over the next few years, would become a thriving massage practice. But naturopathic medicine kept popping up in her life in funny ways. During her enrollment at Seattle Massage School, she would often go to study at a little spot called the Honey Bear Bakery. She soon realized it happened to be just down the street from Bastyr University, one of the medical schools where students trained to become naturopathic doctors. During breaks from her studying, she would wander the Bastyr halls, thinking about what it might be like to be in med school. But when she contemplated the idea of going this route with her education, it felt intimidating and like something she could never do. Still, it was fun to dream. Although she was now doing well as a massage therapist, her headaches and chronic head pressure continued to persist. She was always searching for solutions but couldn’t seem to find anything that would truly make them go away. Then one day her hair dresser mentioned a doctor who does this “really weird” treatment that can help with headaches. She put Hillary in touch with Dr. Dean Howell, a naturopathic doctor who was one of the developers of a treatment called NeuroCranial Restructuring (NCR). Hillary was apprehensive about the treatment at first but, after talking extensively with Dr. Howell, as well as doing her own research, she decided it was worth a try. It was the right decision. Her very first NCR treatment was a total game changer. All her life, to one degree or another, she had felt as though there was a vice grip attached to her head. After that first treatment, it felt like the vice grip had been loosened. By the end of the first four-day series of treatments, the vice grip was gone. And by the time she had completed a total of three NCR sessions over the course of the next eight months, her headaches had been completely eliminated. It was a radically life-altering moment that affected almost every facet of her experience. It improved her mood. It changed the structure of her face. It improved her posture. She lost twenty pounds in two months. Most profoundly, she didn’t wake up in the morning with a headache anymore. But one of the biggest changes was in how she started to think differently about where she was going with her career. She was so inspired by NCR and the impact it had on her life. It had helped something she thought was un-helpable. At the same time, she was not seeing the same level of results in her massage practice. She had many clients with chronic health conditions that she couldn’t resolve with massage, and she was losing her motivation to continue. What she really wanted was to be involved with NCR. But the treatment could only be administered by an MD, a DO, or an ND. So she went to Dr. Howell and basically begged him for a job. It turned out the timing was perfect because his practice was expanding rapidly and he was at the point where he needed to hire an assistant. She got the job, and for the next four years, worked as his assistant, doing everything from assisting with the actual NCR procedures to traveling around the country training other assistants while he trained other doctors. Dr. Howell’s practice was packed to the gills, and they would often see 40 patients in a day. She saw NCR helping people more than anything she had ever seen. She saw so many patients like herself who had been on long, difficult journeys searching for something that could help them. She saw the treatment help headaches, breathing disorders, anxiety, depression, phobias, OCD, as well as many other conditions. She saw it helping everyone from athletes with Traumatic Brain Injuries to children with Down’s Syndrome. By the end of that four years, she started feeling like she had gotten enough experience with NCR that she was no longer going to be satisfied just being the assistant. She wanted to perform the treatments herself. The only thing standing in her way was a degree. Before NCR, the idea of med school had seemed impossible, like an insurmountable task that she could never live up to physically or mentally. But now it felt attainable. Now, with NCR having fundamentally changed the course of her health and life, she had access to new levels of energy and motivation that all added up to a feeling that yes, she could, in fact, become a doctor if that’s what she really wanted to do. And so she committed to the daunting nine-year education, including getting prerequisites at a community college, earning her undergraduate degree in Nutrition, and finally, in 2007, graduating from Bastyr University with her Doctorate of Naturopathic Medicine. For Hillary, med school was a direct path to being able to practice the treatment that had so undeniably saved her life. Straight out of school, she started her own private practice offering NCR and was soon overflowing with patients. 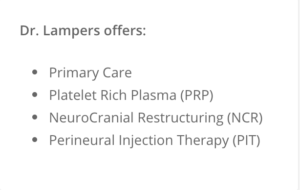 She has since built on her success with NCR by expanding and offering other highly effective, specialized procedures such as Perineural Injection Therapy (PIT) and Regenerative Platelet Rich Plasma (PRP) Injection Therapy. 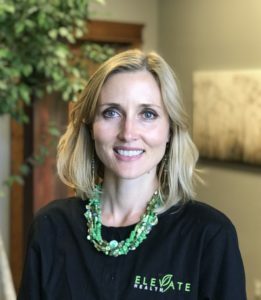 Drawing from her earliest experience with naturopathic medicine, she utilizes the foundational principles of a healthy lifestyle along with her specialties to create a holistic and well rounded experience for her patients. In 2008, she rekindled her connection with Bozeman by opening a part-time practice here, flying back to see patients every couple months and trying to figure out how to live here permanently. Now that she has moved to Bozeman, it feels like quite the homecoming. In the midst of her early twenties angst, she admittedly couldn’t wait to get out of here. Now that she’s back, it feels like coming home from a really long vacation. In her opinion, home is where you feel best. And she feels best in the mountains of Montana. When Hillary is not seeing patients, she enjoys hiking, gardening, travel, spending time with her children, and working with her husband on their outdoor lifestyle podcast Hunt Harvest Health.